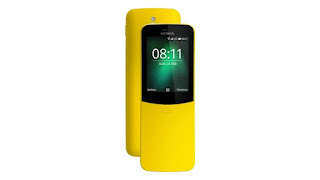 Meet the new Nokia 8110 4G Smartphone launched by HMD Global Today, The new Nokia 8110 4G can also be called Banana phone due to its curved shape and Yellow colour option, is now available to buy in over many countries now including India. In terms of Specifications, The new Smartphone is a Dual (Micro+Nano) Sim and it runs on KaiOS, and sports a 2.45-inch QVGA (240x320 pixels). The device is powered by a 1.1GHz dual-core Qualcomm Snapdragon 205 SoC, paired with 512MB of RAM and 4GB of inbuilt storage. The Nokia 8110 4G Banana comes with a 2-megapixel rear camera with LED flash, while there is none on the front. The phone connectivity options include 4G, Wi-Fi, Hot spot, FM, Bluetooth, Micro USB. The Nokia Battery Capacity is 1500mah which can last up for 9hrs talk time.